With 80 families using our free pantry, we go through an enormous amount of food here at the House. We love your donations any time of year — you can deliver the food directly to the Seattle House or buy it from our Amazon Wishlist. Check out the Seattle House wish list for more information on donating food! We’ve also prepared some handy sheets listing our food needs that you can print and take with you to hand out at your chosen donation site, like outside of a grocery store or in the break room at your workplace. New products directly from a store to give us the longest possible time to use them. Please do not donate any food that is near or beyond its expiration date — we cannot use it and it will be thrown away. All items must be 16oz or less in size. We cannot accept home-canned goods. We know that family comes first and that our residents don’t always have a time to pack a bag before they get here. We offer things like shampoo, toothbrushes, other toiletries and supplies to families who are medivac’ed here or in a rush because of extreme medical emergency. We invite you to collect toiletry items listed on our wish list for families in need. During the holiday season, your donations to our Toy Room will give parents a chance to “shop” for gifts for their children. Click here to check out our current needs. 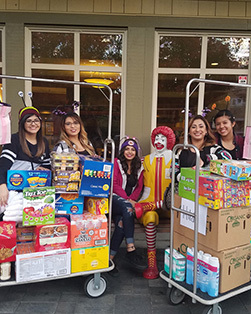 If you are interested in organizing a food or necessities drive, please contact Kaarin at kaarin@rmhcseattle.org who can help you get started, arrange drop off of goods, and give you a banner to promote your drive.